Pangea World Theater began in 1995 with the following mission: "Pangea illuminates the human condition, celebrates cultural differences, and promotes human rights by creating and presenting international, multi-disciplinary theater." Inexplicably, I have not seen any of their work until last weekend. 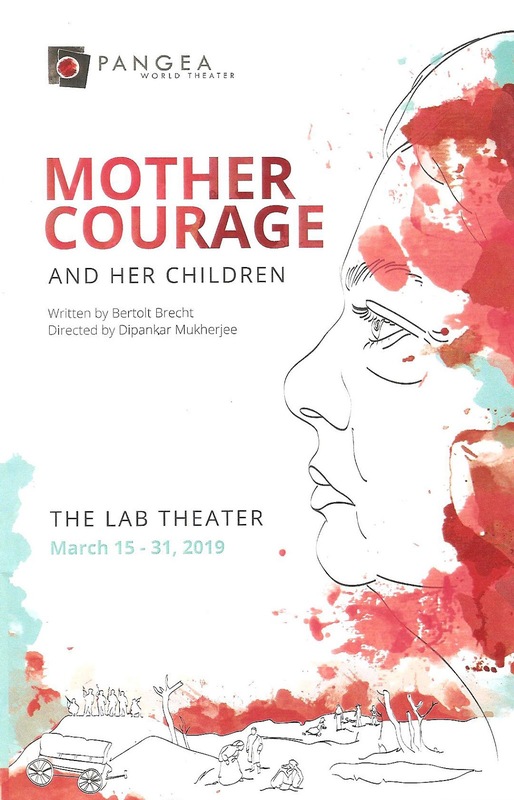 I'm happy to jump on board with their thoughtful and thought-provoking production of German playwright Bertolt Brecht's Mother Courage and Her Children, performed at the gorgeous Lab Theater in Minneapolis' North Loop neighborhood. Written at the start of WWII, it tells the story of a woman and her children during Europe's 17th Century Thirty Years' War, but its themes translate to any and all wars occurring around the world. Specifically the way some parties seek out war and encourage it because of the profits that can be gained, while others pay the ultimate price. A strong ten-person ensemble and cool design elements effectively tell this important story. I sometimes have a hard time with Brecht and his method of disassociating from emotion, but I was able to stay fairly invested in this piece and the characters. I also hear they significantly tightened the runtime to just over two and a half hours (short by Brecht standards) when I saw it. The titular character is not a sympathetic one; she's the one who seeks out war for the profit to be gained from peddling goods out of her cart, with her three children to help her. Or perhaps, that's the only way she knows to survive and care for her children in the war-torn world she finds herself in. One by one she loses her children to the war, but continues following the war and selling her goods, because what else can she do? Adlyn Carreras is a strong Mother Courage, tough and unrelenting, but caring for her children in her own way. Stephanie Ruas gives a beautiful wordless performance as her mute daughter, often hiding from the world and her great depths of feeling, but finding her own courage at the end. Clay Man Soo and Kat Purcell are Mother's very different sons, doing what they need to survive as well. David Wiles brings a dignity to the role of the chaplain, Ricardo Beaird provides some much needed humor as the cook, as does Heidi Berg as the prostitute turned Colonel's wife. Rounding out the cast are Marcela Michelle, Meg Bradley, and Michael Ooms, playing various soldiers and civilians immersed in this long war. This isn't a musical, but there are songs, mostly sung a capella by the cast, which aid in the storytelling. Sound effects create a somber and sometimes creepy atmosphere (sound designer Eric M.C. Gonzalez, composer Mike Olson, musician Homer Lambrecht). The spacious performance space at the Lab is sparsely populated by a few stools and benches, and one life-sized and beautifully constructed covered wagon, pulled all over the stage by the ensemble (set design by Orin Herfindal). 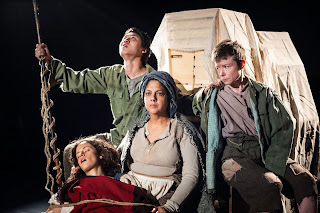 The lighting (designed by Mike Grogan) beautifully plays off the brick walls of the theater, and the cast is dressed in functional military uniforms and ragged peasant garb (costume design by Mary Ann Kelling). The overall effect of the piece is the futility, senselessness, and absolute destruction of war. That's something that never changes, and a lesson that humans still have not learned after centuries of death and violence. Mother Courage and Her Children continues at the Lab Theater through March 31.